Mobile devices have exploded onto the educational scene, with more and more students bringing laptops, phones and other devices into schools and universities. With ‘round the clock’ usages for both educational and recreational purposes, students expect to connect ‘anywhere, anytime’ on campus. In response to this rapid growth in BYOD devices, and the use of technology in education, many educational establishments, particularly high schools, colleges and universities are setting clear mandates to integrate technology as part of the learning experience. However, many are struggling due to ageing networks and ever increasing BYOD devices. 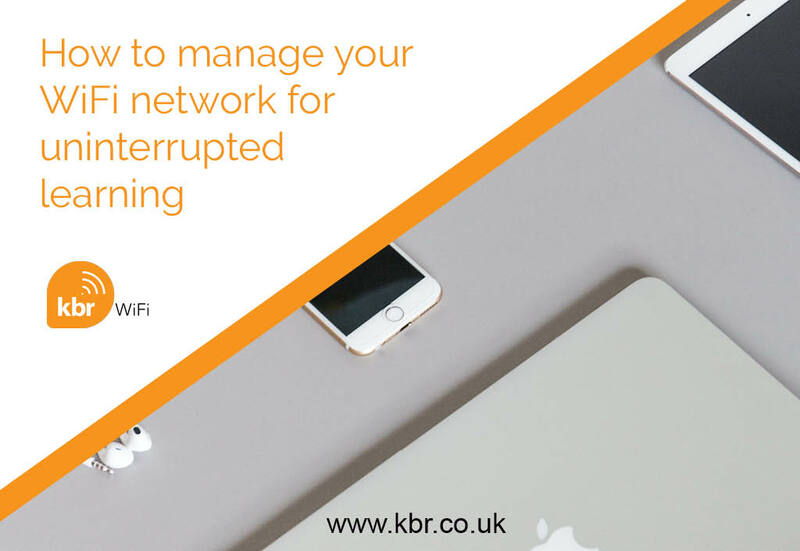 With older devices taking up more bandwidth, roaming issues affecting connectivity ‘on the move’ and the chatty Bonjour® protocol causing a ‘capacity crunch’, schools, colleges and universities are turning to WiFi and cabling providers such as KBR to find a solution. So, how can you manage your WiFi network for uninterrupted learning? The first and most important step is to assess your wireless network’s ability to supply the current demand of your school, college or university, using an active WiFi survey, often known as heat-map surveys. This involves the use of specialised hardware and software to measure the signal strength of your current solution, vs. the proposed WiFi solution in all parts of your site or campus. This ensures you obtain the required signal strength in all the necessary areas on every type of mobile device you wish to connect to your new WiFi network. This can include both internal coverage in classrooms and lesson preparation areas as well as out in the playground, sports field or outdoor student communal areas. In our many years in the WiFi industry, KBR has installed wireless solutions from castles to lighthouses and from large-scale city centre universities to small rural schools. This experience provides us with the knowledge to survey and design your WiFi network correctly. Not just for signal coverage but also client density. An education-grade wireless network is designed to help educational institutions ensure high-performance uninterrupted learning by providing scalable networks that can keep pace with demand. A WLAN solution developed especially for the complexities of school and college campuses will provide you with the performance, reliability, predictability and operational simplicity of a wired network with the advantages of mobility. At KBR, we offer a range of education-grade wireless platforms, and help our customers to choose the right solution for their specific requirements. Our solutions have helped many institutions worldwide overcome their wireless BYOD challenges by offering every IT professional a range of options, flexibility in deployment, and confidence in being able to control various aspects. KBR is an approved installed of a range of industry leading wireless platforms. The impact that technology is having on a student’s education is hotly debated. Nonetheless, mobile devices are on the rise with some reports claiming students carry at least two and even three wireless ready devices (e.g. mobiles and iPads) at any one time. It’s important to ensure your WiFi installer is not only an expert in WiFi network solutions for the education sector, but that they can support you beyond the initial installation period. Select a partner with a long history of installing and managing WiFi networks, and check in regularly with them to ensure your network is running at optimum levels. With over thirty years of experience, you can be sure your new WiFi network is safely installed by KBR. By partnering with KBR you can rest assured you are working with one of the leading WiFi providers in the UK.